Packing central here. Movers will be here before I know it. Today I’m spending time figuring out which personal items to gather in the boxes that will go with us across country, and which to load onto the moving van. How does one decide which photo albums are the most meaningful, which childhood drawings possess the most value? And please, is it even possible to sort through my 25+ writing journals? Laughing as I factor in which one I’d be most horrified if somehow it got tossed from the moving van and discovered by an innocent bystander. Imagining Joe Shmoe reading, eyes wide, about a character plotting murder, certain he’s stumbled upon something truly sinister. (Nope, Joe, just hashing out a novel.) I know what Joe’s really stumbled upon—a woman who couldn’t possibly sort the can’t-leave-it-behind important items from all the rest. as well as passports, medical papers, and school forms. How do you respond when people ask you what you’d run back in to save if your house was on fire? I’ve heard pets, photo albums, the Bible, as well as other poignant books. 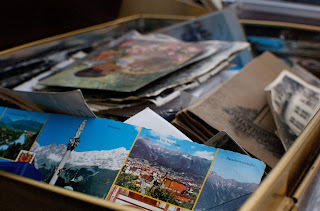 I’m creating a box of memories and it will fall short. It will be incomplete. It won’t make sense to most. Love, nature walks, laughter, ugly cries, growth, deep and loyal affection—they don’t fit in a box. They exist somewhere else entirely. They’ll be going with me in the car alright because they’re stitched into my being—not to be lost or mistakenly read by some Joe Shmoe. The aforementioned—those are the workings of my life. They go with me everywhere—accessible at any given time. *Be back sometime in June…on the road again. 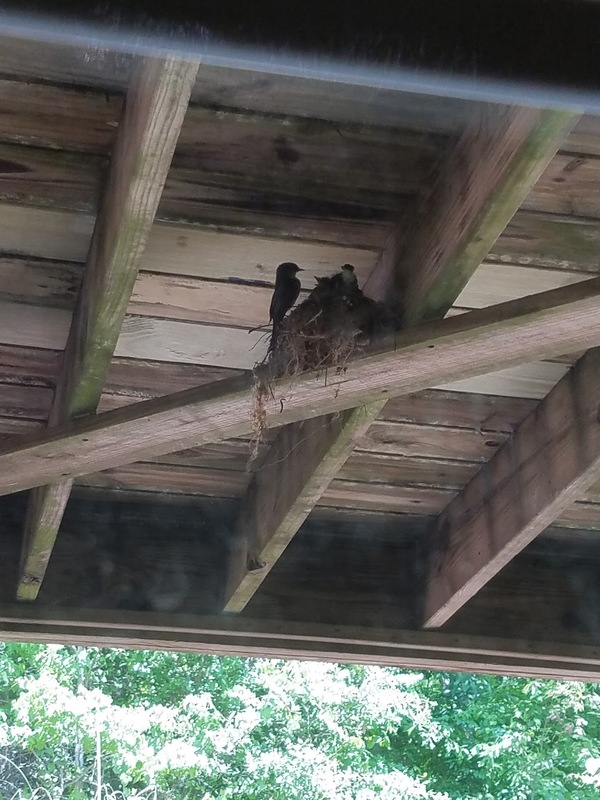 A mama bird with three baby birds. 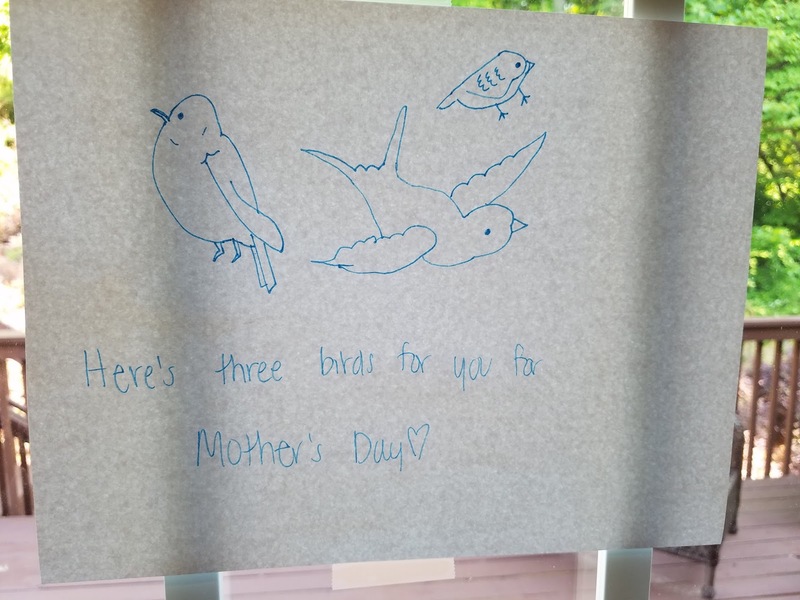 One of my daughters drew this for me for Mother’s Day. My girls were amused at how smitten I’ve been all week by this mama and her babies. Then yesterday, on Mother’s Day, the babies took to the sky. 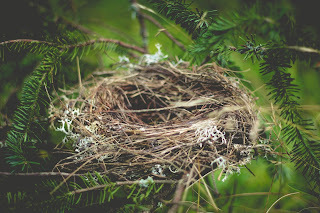 I find the timing of all of this—discovering the nest and the babies flying off—quite symbolic considering my last post. When we moved to our new home in Georgia a little over a year ago, I had plans. I was determined to root and to do all I could to help my girls to acclimate to the area. I foolishly believed we’d be in this house for a long time, maybe forever. My determination to feel settled turned into a mild obsession. I researched everything. I memorized streets, programs, and other aspects of the community. In time, I’ve come to understand I’d been mimicking the behavior of a mama bird. Wiring in my brain triggered me to make this place home in every way possible. While attempting to ingrain in our new surroundings to the best of my abilities, I simultaneously found myself hesitating. And I never understood what was behind that hesitation . . . until now. One year later and we’re headed to a new home. California here we come. I’m about to hit the restart button on all that acclimating and adapting. I liken my experience here in Georgia to a bird I grew quickly fascinated by outside my office window last year. The mama bird captivated me as she gathered grass and fronds, creating a messy nest atop a column. I loved watching her work, and even captured a few photos. Mama bird proved a nice distraction from writing on more than one occasion. In hindsight, I’m glad I took the time to study this bird. She fretted and swooped and tamped down twigs before they could fall, but they fell anyway. The mama bird never did lay eggs in the nest she spent hours to build. 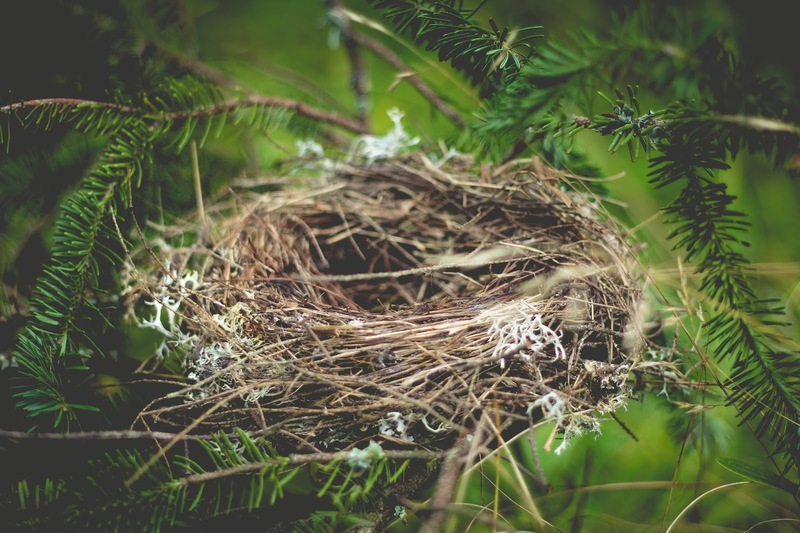 After I told my mom about the bird, she informed me some birds create fake nests to distract predators from the real ones. I wouldn’t say our current home is a fake nest, but I do see now how temporary this stop-over in Georgia was. I’d laugh at my crazy attempts to root and nest, if it weren’t so human—such a mom thing to do. Building a safe place for my girls is my highest calling—teaching them resiliency through change, strength through opposition, bravery through trying times. The older I get, the more I’m beginning to grasp that a home doesn’t exist inside brick or stucco walls. 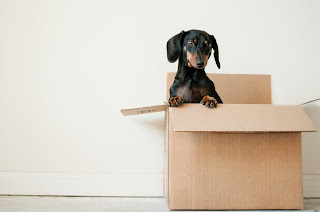 Home is the security that comes from trusting that you’re loved where you are—wherever that may be.